The picture on the top of the page comes from a link on Chet's Twitter, where his friend writes "@chethaze we havin a DEAD MAN PARTY! #greatdayforamerica." 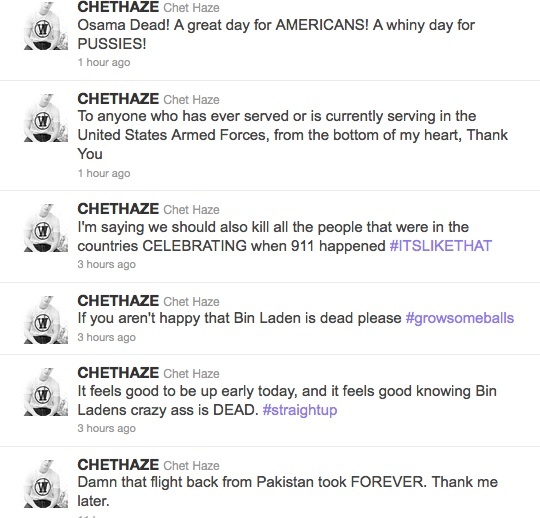 Chet (for those not in college rapping circles) has a couple of singles out, almost all of them dutifully chronicled over at Videogum, where we were alerted about today's Twitter explosion of hate. Since Chet has already been outted as Hanks' son, I wonder how long it will be until he's forced to shut this entire operation down. Or maybe Tom is a fan of free speech and believes Chet has the right to post any sort of miserable rhetoric masquerading as patriotism as he wants. But more realistically, I'm guessing Tom knows about his son's outspoken messages today, and just figures (sadly, but probably rightly) that his hands are pretty much tied here as Chet is over 18 and legally an adult. Don't worry, Tom, I know you and Rita Wilson did your best, and, if anything, Chet only goes to show that even the most well-intentioned adults can have totally misguided kids.